Classic scent of early summer…. if you are fortunate to live near a honeysuckle vine the sweet and heady fragrance will fill your evenings as the flowers gently give off their scent. About 10 years ago the elderly couple that live behind us planted a small, rather sickly little honeysuckle vine in the corner of their property along the fence. Fast forward 10 years and the honeysuckle has taken over our fence, and advanced at least 75 feet, consuming everything it can climb on and producing bountiful crop of blooms. The flowering vine blooms profusely, filling the fence with a dense mat of vine and flower. And the flowers begin opening as crisp white petals, turning a yellow as they age, then dry up. We gather the flowers when they are bright white, and pack them in olive oil and cover the jar, setting it aside for a day or two. Strain the oil, replace the flowers, and repeat this process several times until the sweet perfume of honeysuckle translates into the olive oil, creating honeysuckle essential oil. And with home distilled essential oil, we make Honeysuckle Soap. 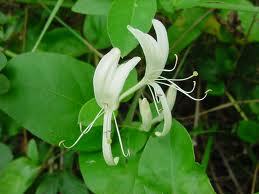 It is very popular in late spring and early summer. 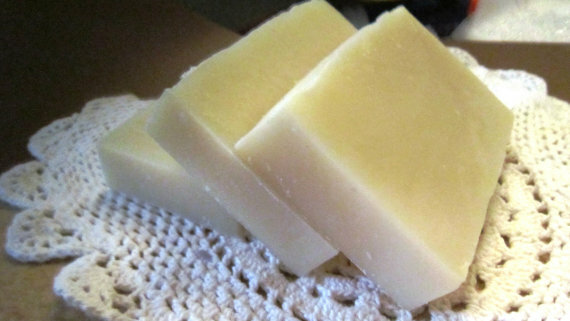 Our Soap is a blend of olive oil, palm and coconut oil, lye and the essential oil of homemade honeysuckle essential oil. The smell of honeysuckle survives the saponification process, resulting in a richly luxurious sudsing soap.